The evening started with a wonderful ‘Platform’ conversation at the National Theatre with Sam Mendes talking about his current production of King Lear, starring Simon Russell Beale in the lead role. It was a brilliant talk with not just insights into the thinking behind this acclaimed production (which I saw a couple of weeks ago) but the way Mendes works. From there it seemed an obvious choice to wander up across Waterloo Bridge and into Covent Garden for a meal. 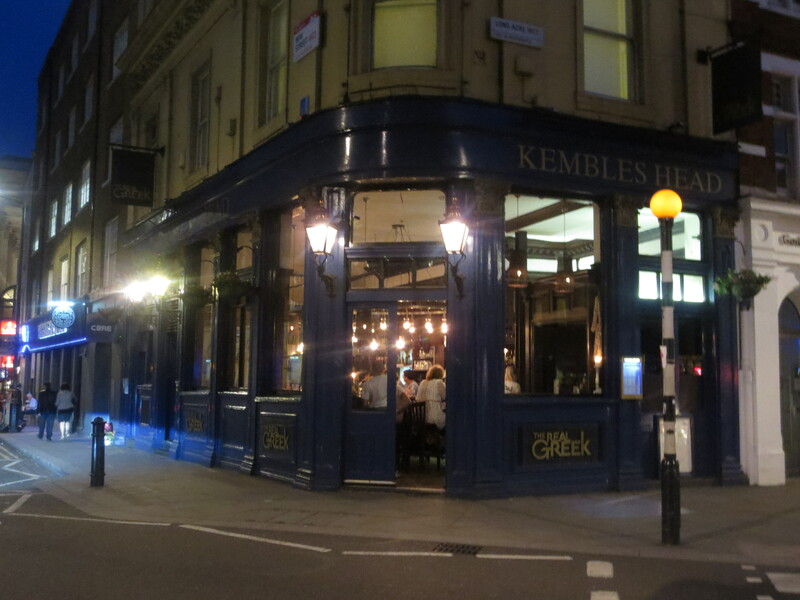 I’d suggested to Annie that we tried The Real Greek and had booked a table for 7.00pm. I’ve passed The Real Greek a number of times as I’m often in Covent Garden. It’s on the corner of Bow Street and Long Acre, just a bit further on from The Royal Opera House. 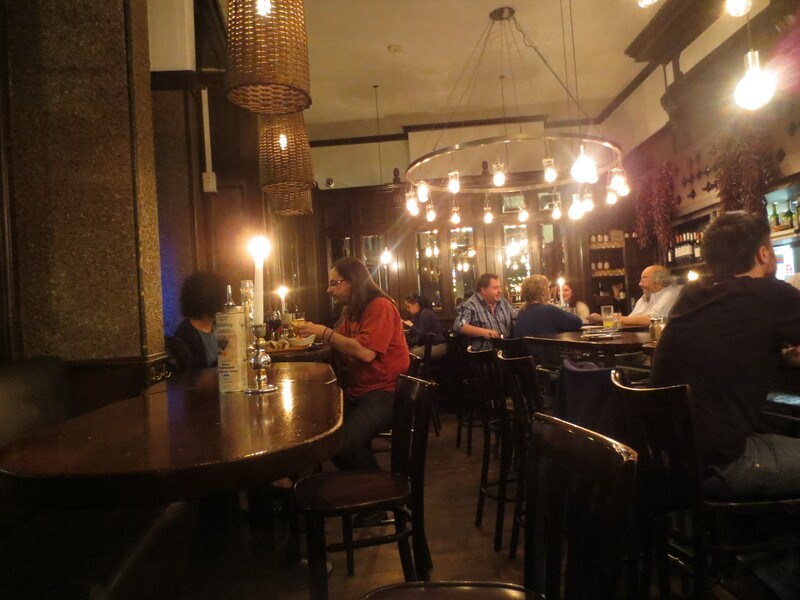 To be honest, it just looks like a converted pub that is always quite noisy and very busy and I’d never really considered it as a place I’d want to eat. But then I did the brilliant Greek Masterclass with Tonia Buxton, as a guest of Total Yoghurt, and received in my ‘goody bag’ that day two £10 vouchers towards a meal at any Real Greek restaurant (there are six in London). Well, that’s an incentive and given the convenience after our late afternoon theatre visit, a good choice. The talk finished earlier than we expected and so we arrived at the restaurant at about 6.35. It was heaving with people; very crowded and busy. I explained we were very early and happy to come back at the booked time if they didn’t yet have a table for us. They were quite apologetic about having to send us away, but we didn’t mind and just wandered around Covent Garden for a bit. Back at The Real Greek at 7.00, more apologies; we might have to wait another 5 minutes. That’s fine, we said; it was no big deal. We really didn’t mind but they offered a glass of wine on the house while we waited. Wow! What service. I was already impressed. 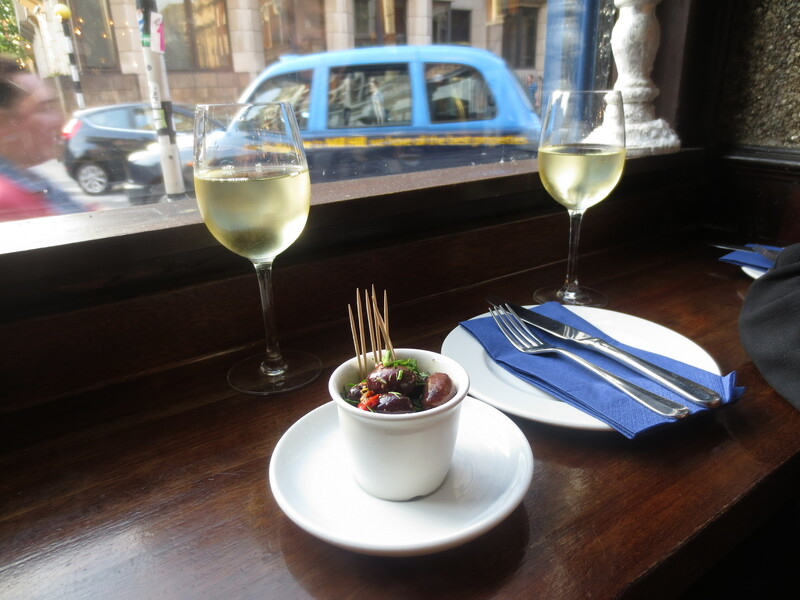 Soon two glasses of a delicious white wine were put before us and some very gorgeous olives. We took a couple of stools at a bar area near the door and were very happy waiting for our table. There aren’t tables as such – they’re quite high bars with stools and banquettes but where we eventually sat was more ‘table’ than where we’d started. The menu came and the friendly waiter asked if we’d been to a Real Greek before and pointed out some specials and new dishes. The menu is all ‘meze’ choices: cold and hot. There’s a kind of ‘starter’ section that is brought first, especially if you order cold meze. Then you can choose larger meze of traditional Greek dishes like kebabs, souvlaki, lamb cutlets, lamb kefte, plus vegetarian dishes like grilled halloumi. There were some set menus too but we thought it more fun to choose. And the choice was brilliant. How would we decide! So, we started with a cold salad: Melitzanosalata – a light and fragrant blend of smoked aubergine, garlic, shallots and lemon. 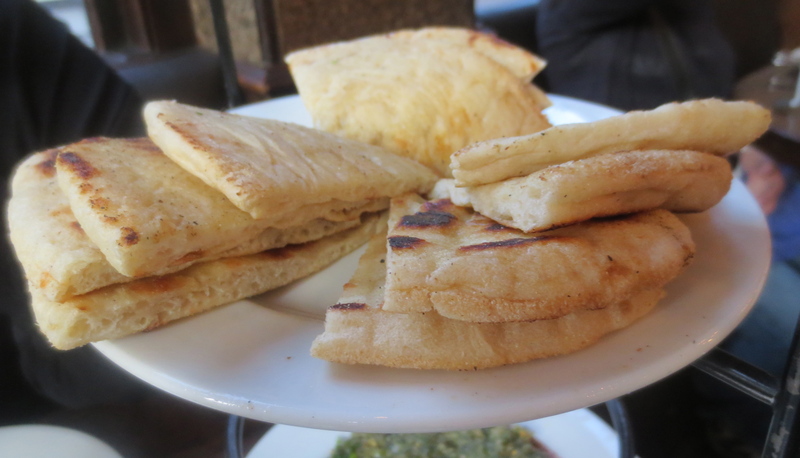 And we had some Greek flatbread to go with it. 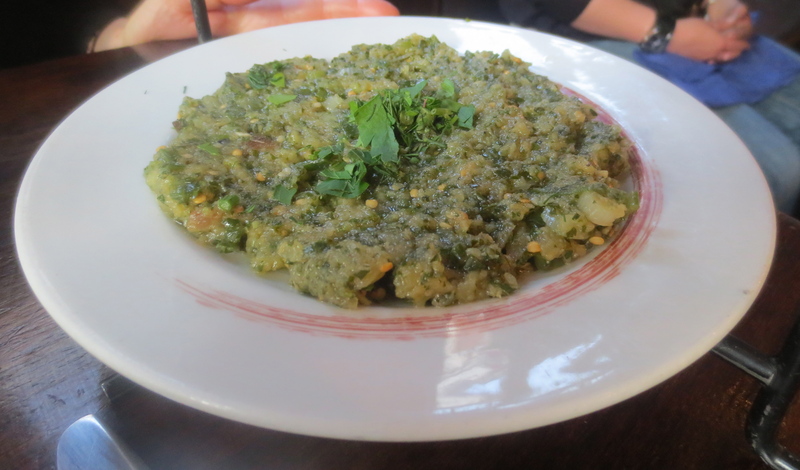 The aubergine salad was delicious: slightly smokey but fresh tasting with the lemon and shallots. The bread was quite soft with a lovely flavour. Other dishes were brought as they were ready from the kitchen. 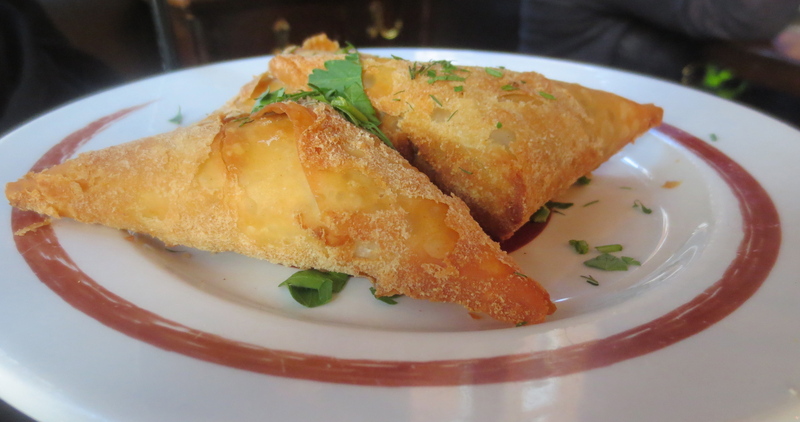 Next came Tiropitakia – filo pastry parcels with creamy leek, spinach and feta filling. These were wonderful: hot; the pastry gorgeously crisp, opening with a bite into a delicious creamy filling, sweet with the leeks, slightly tangy with the feta. Next up were Lamb Meatballs – lamb patties grilled and topped with Greek yoghurt, tomato sauce, onions and sprinkled with paprika. 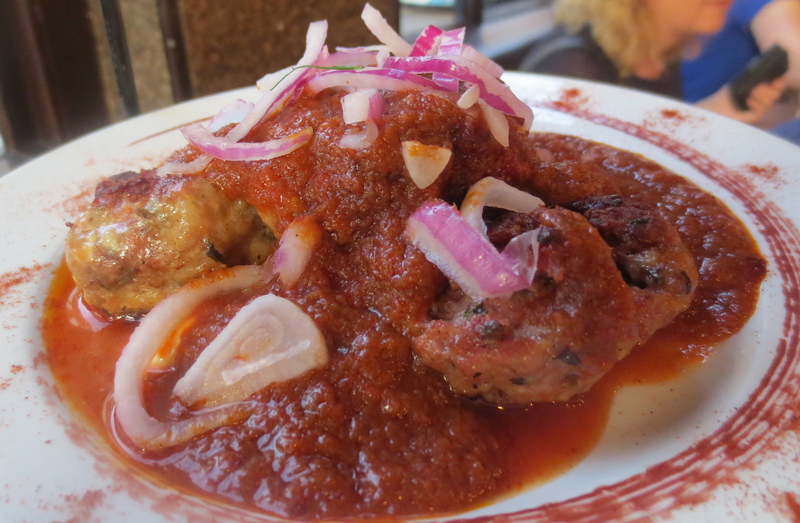 The meatballs were tender and delicious with a caramelised edge from the grilling; the sauce rich and a wonderful accompaniment and I loved the Greek yoghurt running through it. 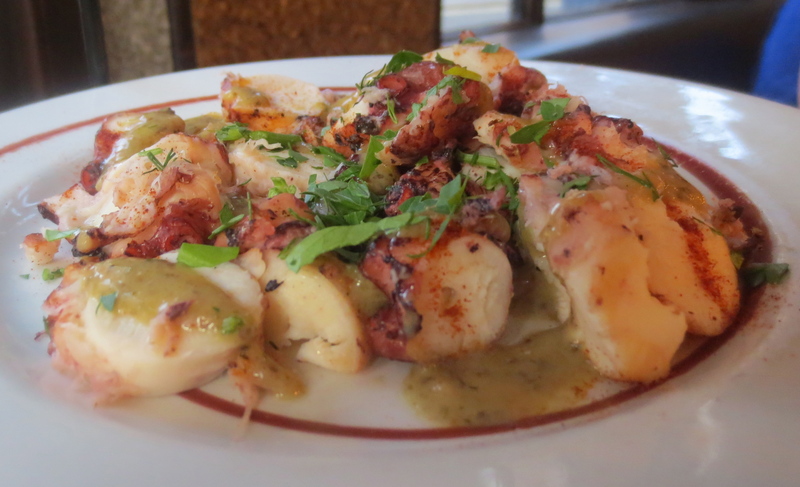 We’d also chosen Grilled Octopus – chargrilled and tossed in olive oil, garlic and Greek mountain oregano. The waiter had enthusiastically recommended this which is partly why we went for it and it was very good. The octopus (which can be awful if badly cooked) was so tasty and tender; quite meaty in thickish slices. 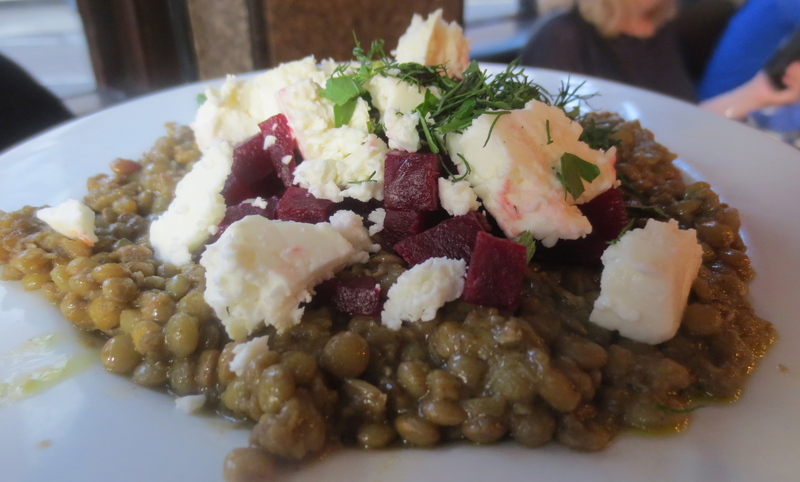 We’d chosen one salad/side of Beetroot, Feta & Lentil Salad. When we finished another waiter came with a dessert menu; could he tempt us, he asked with a smile. But no, the desserts looked great but we were full. We hadn’t quite managed to eat all the other food; we’d ordered more than the recommended 3-4 dishes for two to share – but we couldn’t resist trying it all. We just ordered coffee. The whole meal was wonderful and – to be honest – so much more wonderful than I’d anticipated. I’m never quite sure what to expect of Greek restaurants in London and I rarely go to them. I think walking past the restaurant all those times before I’d been reminded of bars selling inauthentic tapas that are always disappointing but here at The Real Greek, it’s the real thing. This was definitely excellent. We loved the atmosphere too. Yes it was busy and quite noisy but it died down a bit once we were past the pre-theatre time … though perhaps, we considered, we were just getting used to it. The service was so friendly and I was reminded of my last time in Greece three years ago, in Kardamyli, and how much I like the Greeks for their open friendliness and the way they so easily engage in conversation. This was a great find, we decided, and without doubt we’ll be returning very soon! Sounds absolutely delightful! We’re heading to England for the first time in Sept…perhaps we’ll pop in and try it out! Thank you. It’s a good fun place; the meze delicious. And very central if you’re in London. Hope you have a good trip! I walk past every day on my way to work and back again- and your thoughts before visiting sum up the vague thoughts I had about it as well! Now I can’t wait to put that right and go! It’s always busy but so are so many places in Covent Garden – but your descriptions of the food and the service sound spot on. Further down the road back towards Waterloo- I always mean to “perch” in Siam and try their thai curry – and then another evening Champagne and cheese next doorish. Plus Notes for Coffee – and then the Bakery at Balthazaar just round the corner. Gorgeous bakes – and always friendly, intelligent service. It’s a street which has improved a lot food-wise – and is very tempting! Thanks Sally. Nice to hear you got the same impression and hope you like it as much as I did when you try it out. There are so many wonderful places to eat or just have coffee in the area.